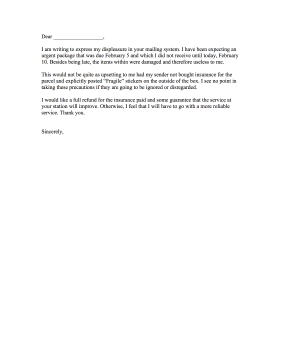 File a complaint with the United States Postal Service or your local mail carrier with this printable complaint letter. I am writing to express my displeasure in your mailing system. I have been expecting an urgent package that was due February 5 and which I did not receive until today, February 10. Besides being late, the items within were damaged and therefore useless to me. This would not be quite as upsetting to me had my sender not bought insurance for the parcel and explicitly posted "Fragile" stickers on the outside of the box. I see no point in taking these precautions if they are going to be ignored or disregarded. I would like a full refund for the insurance paid and some guarantee that the service at your station will improve. Otherwise, I feel that I will have to go with a more reliable service. Thank you.